"Cantú personalizes the U.S.-Mexican border and all of its complexity in a way I've never seen. His writing is beautiful, with haunting and detailed descriptions of the desert, the immigrants, the cartels, and his own fears about violence and identity confusion. The criminalization of searching for a better life and the dehumanization of the process is looked at from several angles, and his journalistic approach does not make judgments, but clearly tells the facts. A great new writer to follow." 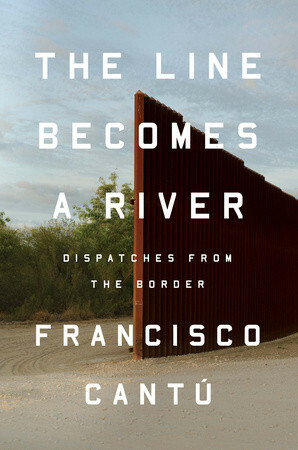 The Line Becomes a River is a detailed account of Cantú's time stationed in the deserts of Arizona, New Mexico, and Texas from 2008 to 2012. He and his fellow agents track migrants who attempt the dangerous border crossing, bringing in the dead and detaining those who make it across alive. But when Cantú, who is the grandson of Mexican immigrants, returns to civilian life after years of patrolling the Southwest's smuggling routes and drug corridors, his good friend José is detained, and the cruelty of current border policy becomes truly real to him for the first time. Cantú, who lives in Tucson, Arizona, is a former Fulbright fellow and the recipient of a 2017 Whiting Award. His essays and translations have been featured on This American Life and in Best American Essays, Harper's, Guernica, Orion, n+1, and Ploughshares. He currently works at the University of Arizona, where he coordinates a field studies program that provides local research opportunities to MFA students who are interested in writing about the border. 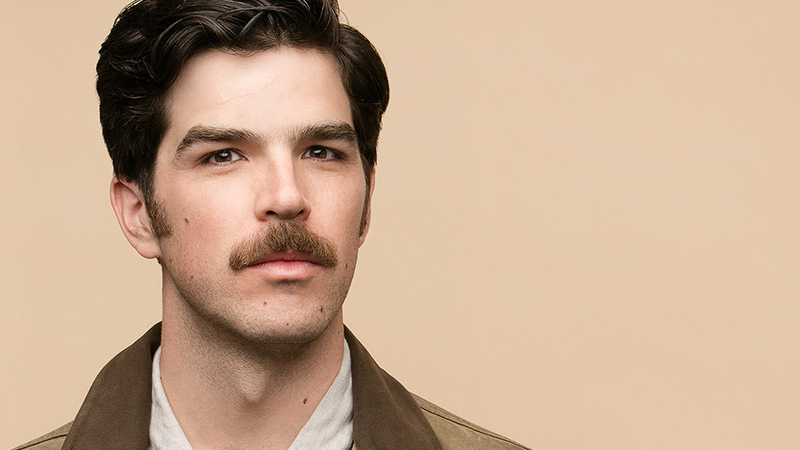 We spoke with Cantú about why he joined the Border Patrol; the current politics of immigration, including President Trump's proposed border wall; and the ways in which the border wreaks violence on both sides of the line. I'm asked a lot whether I joined the Border Patrol thinking that I would write a book about it, and I definitely didn't. In college I read a lot of border literature, pretty much anything I could get my hands on, and so I really joined thinking it would be a way to deepen my understanding of the border and that I would be able to use that understanding later on in my career as an immigration lawyer or a policy maker. 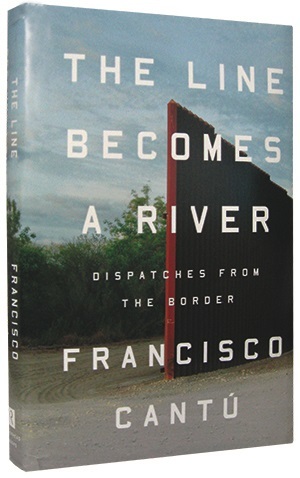 Did you also write The Line Becomes a River in part to help readers see the border as more than just an abstract idea? Yes, once I realized I was writing a book, applied for an MFA program, and had the tools to start thinking about it as a larger project that would be read by others, then the drive became to present the border in a very honest way that I felt represented the nuance and complexity that I saw. So that's definitely a big part of what I hoped to accomplish with the book: to present it as something that isn't black or white. I think, especially right now, there is a tendency to talk about the border in these sort of quick sound bites and easy answers, like stopping immigration by building a border wall. Especially as someone going into it with questions and not having those questions answered, my experience was that the border is such a huge, complex place; it's a violent place but it's also a beautiful place, and I wanted to try to capture all of that and present it in a way that was ok with not finding solutions or answers. The book's structure consists of detailed recollections from your time as a border agent, accountings of your dreams at the time, and essays on the history of the border. How did the book's varied structure come about? The very first writing that I did about my experience in the Border Patrol really came out of this journal I kept during the first year or two in the field. There was the gradual process of eliminating the journal format and then finding a narrative arc to represent those experiences. The second part of the book seems very distinct from the first because I was working in the intelligence field doing a very different kind of job. The third part of the book, when a friend of mine left the country and was apprehended trying to cross back into the U.S., didn't happen until I was already in the process of writing. I was so marked by that experience, and it was so intensely emotional, that I sort of realized that this was also a part of my story of understanding the border. It was the first time that I really started looking behind the curtain of what happens to the people I was encountering as an agent and then just sending on their way; I really had no idea what was happening to them after that. All of a sudden, I was seeing all the ways that that small moment of being apprehended in the desert reverberated through the life of a person and their family. What was the timeline of writing this book? Were you still writing it during the recent presidential campaign that brought immigration issues to the forefront? I had been working on the book more or less since I left the Border Patrol in 2012, but I guess I really started working on it in 2013. We actually sold the book to Riverhead before the election, so I think everybody involved was imagining that this book would be published in a much different political landscape. I think the thing that is important, though, is that so many people are focused on the border now--so many people are seeing this issue in a new light just because of the political climate and because of this drumbeat toward building a wall or deporting Dreamers. So it seems really awful to people now, I think. There's this idea that things are so much worse now, but for a lot of people who live along the border, we know that this has been going on for a long time and it's been bad for a long time. José's situation in the book was unfolding under the Obama presidency, and the militarization of the border, the weaponization of the landscape, people crossing and dying, have all been going on through Clinton, through Bush, through Obama, and now through Trump. It's almost outside of politics in that way. Now that you've had these experiences, where do you come down on border security and other immigration issues in terms of how things should actually work? To be honest, I didn't write this book because I think that I have some profound solution to our country's border issues. To me, the most important thing right now is that there is an opening to start talking about immigration reform, border security--all of these things. What I think is missing from that conversation is acknowledging this as a huge and nuanced and complex issue, and also acknowledging the actual human cost of the current policy, before we even start to talk about how we're going to change that policy. For me, my first and primary concern when I start to think about a conversation about immigration reform is all of the people who die trying to cross the desert; you don't hear people talking about this. There are hundreds of deaths each year, and those are just the ones that get reported. Whether or not it's intentional, the policy as it exists is enforcement through deterrence: Deterring people from crossing by counting on the fact that the landscape is so rugged and imposing. One thing that surprised me in looking at this whole thing and looking at José's experience is that no matter what version of hell you put at the border, people will endure it to cross over to the other side. I think what we have now is a total humanitarian crisis that is happening in Mexico and on our own soil, but we're still not acknowledging the people who die crossing over. We don't know their names, we don't mourn their deaths. To me, that's the first thing that I hope changes. What's been the role of indie bookstores in your life? I love bookstores so much. I'm such a book nerd and a bookstore nerd. Any time I go to a new city, the two things I seek out are the local bookstore and a good coffee place; that's kind of my way of traveling around the country and the world. "Kristin Hannah's The Great Alone is a powerful, compelling story of survival--survival of the natural elements and of the human spirit. It's 1974, and 13-year-old Leni Allbright lives with her devoted mother, Cora, and abusive father, Ernt, who was a prisoner of war during Vietnam. America is changing after the war, and Ernt thinks their best chance at a fresh start is to move off the grid, to America's last frontier--Alaska. Grizzlies, wolves, and dropping temperatures are Leni's worries outside of her family's cabin, but as Ernt's battle with his demons rages on, it's no safer inside. The result is a beautifully descriptive, heart-wrenching adventure." "Both incredibly poignant and unceasingly charming, How to Stop Time is the story of a man who has an abundance of time and a scarcity of love. Tom Hazard ages very slowly, so slowly that nothing feels new to him as memories from the past crowd every moment of his present. He has also discovered that time without the people we love loses all meaning. Matt Haig takes us from Shakespeare's London to the Roaring Twenties in Paris, from conquering the new world with Captain Cook to present-day Los Angeles. Scenes both familiar and exotic thrum with life, but the real magic is in how he makes us believe in this 439-year-old man who is only now learning how to live." "Tayari Jones comes in fierce with An American Marriage. Delving into the lives of the newly married Roy and Celestial, this is a novel that pulls no punches from beginning to end. I won't ruin the surprise, but they're hit with a harrowing event that will define not only their relationship, but each of their lives, forever. Writing with an intensity and pace worthy of Donna Tartt, Jones yanks us into her characters' lives with a grip that never lets up. I cannot wait to put this in people's hands!" "Maggie O'Farrell's memoir left me breathless and heart-sore. There were times I literally had a fist to my own heart in sympathy. The encounters told according to each limb or organ is a genius device; it is as though each distinct part of her body had its own voice and wanted my sole attention. Even the spaces of years between each event were full of meaning and nuance. This is one of the most mesmerizing memoirs I have ever read. The breadth and scope of Maggie's 17 brushes with death left me gasping for air, and her strong voice is indelible: There is no victim here, and life is to be treasured but not treated too delicately." "An unforgettable first line propels this debut novel about two brothers on the Australian frontier who are drawn into a world of conflict and revenge that tests their beliefs and morals to the ultimate degree. The age-old conflict between settlers and indigenous people is played out on the southern continent much as it was in the American West and Russian East. As the brothers become deeply embroiled, they enter a savage and unforgiving landscape, both physically and culturally, and it becomes the ultimate test of their growth and humanity. This is a work that is as unrelenting as the world it describes and will long linger with the reader." "I never understood what it meant for someone's writing to be 'lyrical' until I picked up Red Clocks. With beautiful prose, Leni Zumas tells the story of a young girl seeking an abortion in a world where abortion is illegal and dangerous; a woman on the quest to have children when in-vitro fertilization is illegal and folks aren't allowed to adopt without a partner; a woman in a dead-end marriage desperate to escape from her husband and children; and a woman considered a witch by most who provides homeopathic reproductive healthcare, including illegal abortions. Zumas beautifully weaves these stories together and gives each individual a strong and unique voice, while also maintaining suspended disbelief. These characters felt real and this world felt possible. I suspect this will be one of the best books published in 2018." "Vivian Miller is a CIA analyst working on Russian sleeper cells. She is good at her job, and dedicated. But what she discovers will blow apart everything she thought she knew about her life. What do you do when the choice is country or family? How do you protect your children--and Vivian cares deeply about her children--while walking a tightrope between two superpowers? What do you do when the betrayer is closer than you could have ever imagined? There are twists and turns aplenty as Vivian steps into a dangerous game that could destroy everything she loves and values. Karen Cleveland keeps the tension going right to the very last page." "A full and arresting examination of the search for a sense of belonging to one's self, Freshwater reads like the result of a successful dinner party hosted by Chimamanda Adichie, with a guest list featuring Octavia Butler, Neil Gaiman, Salman Rushdie, Helen Oyeyemi, and several preeminent cultural and sociological scholars. Freshwater follows Ada, a child born with 'a foot on the other side,' through her early life in Nigeria and her emigration to America, where she is trailed by many forces from the lands she left behind. It gives us new vocabulary and territories for exploring the awkwardness of intersections that we encounter--gender, culture, tradition, history, personal mythology--and how one might go about locating herself in the pull of so many competing influences." "It has been many years since I can recall encountering such a moving collection of essays. Dawn Davies paints a searing account of her life, from the dating years through the joys and the darkness of motherhood. This engaging debut combines striking prose with fearless honesty to create a profound and thoughtful work. It is a completely immersive experience and one that will leave readers with much to contemplate long after they turn the last exquisite page." "Malmquist's debut autobiographical novel opens at top speed as we meet Tom in the hospital and learn that his pregnant girlfriend's life is in danger. With a velocity unlike any hospital drama, Malmquist captures the chill of the medical staff and his forced navigation of a clinical, emotionless world. Malmquist's writing style is unlike any I've recently experienced. He captures the ordinariness of daily life and the mundane choices we must make as citizens of this world. His ear for dialogue makes you feel present and privileged to be part of the conversation. I have not experienced such skillful, unrelenting examination by a writer tackling life-and-death circumstances and what it means to live in a changed world as I have with this book." "The minute I opened The Unmade World, I was knocked off my feet. The grace with which Steve Yarbrough tells the story of Richard, a journalist from California who loses everything one night, and Bogdan, the down-on-his-luck Polish man who's the inadvertent cause, is sheer magic. You are in the hands of a master storyteller at the top of his game, and you will eagerly follow him from a dark winter night in Poland to a football stadium in Fresno, through the hearts and minds of a fascinating cast of supporting characters. A stunning, character-driven noir that will appeal to fans of Philip Kerr and Amor Towles, and, without question, Steve Yarbrough." "I am not the main mystery reader in my household, but I loved The Mitford Murders. With perfect timing for all things Great Britain, Jessica Fellowes definitely deserves her uncle Julian's blessing to place the real-life Mitfords in a fictional Downton Abbey-like setting. It absolutely kept me guessing and satisfied all my English cravings. Well, at least until the royal wedding in May!" "This book ravaged and then healed my weary soul. A micro and macro look at the exhaustion and triumph of black womanhood, Jerkins' essays are poignant enough on their own. When linked together in her book, the pieces become the subtle knife cutting through the membrane of gender and racial disparity that covers our country. Jerkins uses herself not simply as a reference point, but as a dissection, laid on the table and explained." "I celebrate whenever there's something new by Paul Auster. I wasn't prepared, though, for just how moved, awed, and astonished I found myself while immersed in his inventive and grand novel 4 3 2 1. About a life lived fully, about possibility in love and finding a path to take that's the right one, this is a large novel in all respects, but, most importantly, in spirit. In its writing, Paul Auster has created nothing short of a masterpiece." "After a family tragedy, former NHL player Peter Andersson moves his family back to Beartown, where he's gotten a job as general manager for the local hockey club. Beartown is on its way back up, riding the heels of its most successful junior team in years. On the cusp of that victory, news breaks of a crime that shakes the community to its core. When the worst happens, who do you stand by--your team, your community, your family? In Beartown, Backman shows us, once again, that human beings are anything but predictable." "This uplifting and affirming book will alter readers' views about books on death. Nina Riggs' memoir shares the story of both her ongoing battle against cancer and her mother's valiant fight against the same disease. Both women face the realities of their situation with wonderful humor and candor. Readers will find themselves laughing out loud and sharing passages with other book lovers. As a cancer survivor myself, I felt that I was reading the 'bright book' of the season. The hope, spirit, and determination exhibited in these pages will provide inspiration to all, whether dealing with this disease or not." "Saunders' first novel has a steep entry curve. It's not a novel that reveals itself quickly and easily, but if you give it your attention, if you burrow deep into the book, you'll be eminently rewarded. There is a richness and depth of humanity here. There is the strange and wonderful. There is love and grief and mystery all brought together in the story of Abraham Lincoln's dead son, the Civil War, and what may happen to us all after we leave the mortal coil. It's a beautiful and moving book that will stay with you for a long, long while." "We all have a secret self, parts of our personalities that are unknowable, even to the people closest to us. In A Separation, Kitamura stays largely inside the narrator's head, musing on a great many things: the muddled truth that can exist between married couples, the precise pain of infidelity, the myriad tiny betrayals we commit every day. Her prose is perfect, spare and beautiful, and her observations are spot-on. Some of her sentences were so good they startled me out of the story, which might sound like a bad thing, but it really isn't. It just meant I spent a little longer with this book, my mind wandering like the narrator's." "Eighteen years after high school junior Jess Winters vanished without a trace from Sycamore, Arizona, human bones are found near where Jess was last seen alive. Everyone in the small community, from family to friends to teachers, was profoundly affected by the unsolved mystery. Told from multiple points of view, this deeply moving story explores the fateful events that led to Jess' disappearance and slowly reveals the mistakes, secrets, and regrets, but also the humanity and the good, that reside in each of the characters. Heart-wrenching and compassionate in the manner of Kent Haruf's stories, this is a flawless first novel." "Whitehead's new novel is much more than the story of a runaway slave, Cora, who fights her way to the North; it is also a phantasmagorical look at race in America. In this instance the railroad is literal--a train roaring through tunnels constructed like a subway, leading Cora to several unlikely destinations. Like the travels of Gulliver, each of Cora's stops on the railroad is a different version of America, displaying the varied ways in which Americans view race and manifest destiny. With exquisite prose, Colson digs deep into the troubled heart of America, exposing prejudice, tolerance, hatred, violence, and love as readers stop at each distinct station. Cora is a hero for the ages, and Whitehead is a writer who can guide us, like a station master, into the light. This is a fantastic novel."